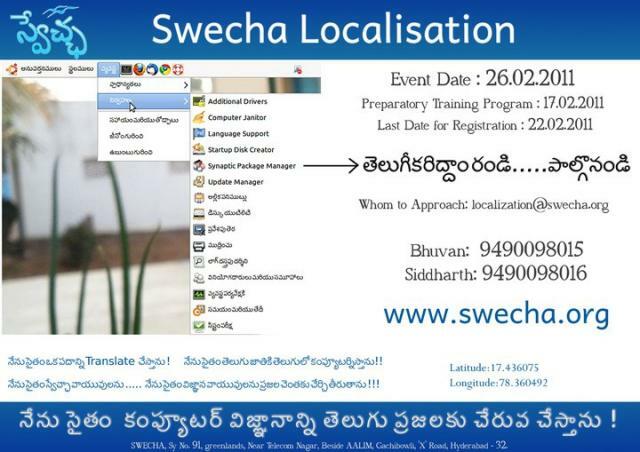 The localization sprint was organized on many occasions and we have been taking the activity forward relentlessly ever since it was conceptualized at Swecha. People from various backgrounds including students, IT Professionals , experts from various domains have actively contributed to this effort. The slogan of "నేను సైతం కంప్యూటర్ విజ్ఞానాన్ని తెలుగు ప్రజలకు చేరువ చేస్తాను" has attracted all educated Telugu speaking people cutting across the boundaries to support and participate. Consistent efforts by evangelists from all walks of life has resulted in evolving it and reaching up to 82% completion. We are just a few steps away from our goal to achieve a 100% localized GNOME which will facilitate in having one complete flavor of a Telugu OS(distribution). Every word you translate can bring hundreds of people....e-illiterates to be transformed to e-literates.